James Franklin Spearman, 91, of 4061 A NC Hwy 903, passed away Sunday, March 31, 2019. Funeral service will be held at 3 PM, Friday, April 5, 2019 at Crumpler-Honeycutt Funeral Home with Reverend Jimmy Johnson officiating. Interment will follow in the Concord Baptist Church Cemetery in Magnolia, NC. The family will receive friends one hour before the funeral service at the funeral home and at other times at the home of his son, Jimmy, at 126 Cypress Trail Lane, Clinton, NC. 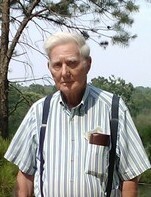 James, born in 1927 in Sampson County, was the son of the late James Vasser Spearman and Ethel Jane Alderman Spearman. He was a farmer and attended Concord Baptist Church. In addition to his parents he was preceded in death by his wife, Emily Lanier Spearman. Survivors include: children, Jimmy Spearman and wife Kay, Joyce Corbett and husband Roger, Joe Spearman and wife Ginger, and Mark Spearman and wife Becky; five grandchildren; and six great-grandchildren. Memorials may be made to the Alzheimer’s Research Foundation, 3152 Little Road, Suite 146, Trinity, Florida 34655.